Likewise, in Germany a cake exists that is called „Spanish vanilla“ (shown on the picture on the left). It has a vanilla-flavored yellow mass in which dark chocolate pearls are embeded. However, the cake does not exist in Spain; At least, it is not common (it may as well be still baked in a small village somewhere). Wherever the recipe originally came from in German cuisine it will be forever remembered as Spanish. 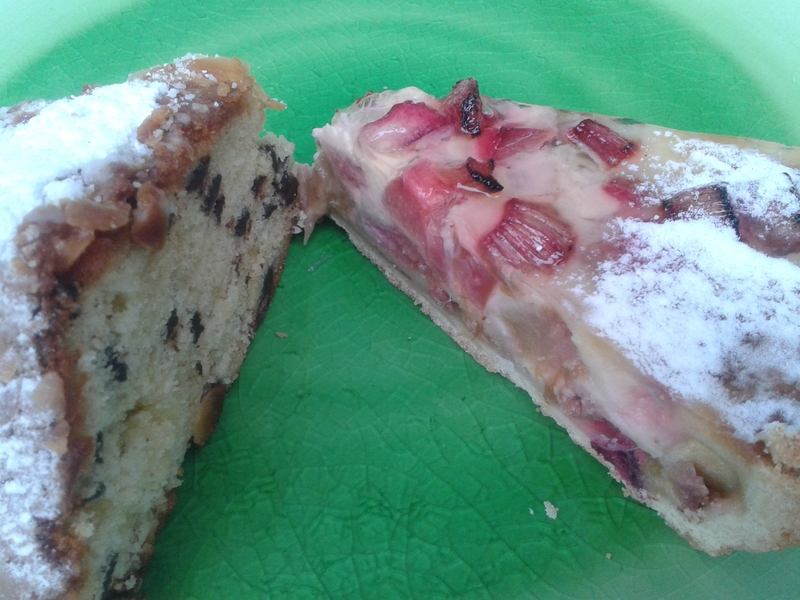 Talking about German cakes, I also would like to present you one of the most typical kinds: Rhabarberkuchen (rhubarb cake – shown on the right of the picture). Personally, it is one of my favourites. The recipes for the two cakes will be posted soon – but be aware, preparing these cakes is work.